The plug-in Toyota Prius (shown as a concept) will be priced at about the same level as the current gasoline-electric hybrid model. Toyota is set to make plug-in technology standard in the Prius -- Europe's top-selling gasoline-electric hybrid -- starting in 2014, the Nikkei business daily said on Monday. The plug-in Prius, which will be launched in 2012, can be recharged from an ordinary household electricity outlet. The 2012 Prius model will be priced at about the same level as the current model, which starts at 25,750 euros in Germany, and will feature high-performance lithium ion batteries, enabling it to travel more than 60km per liter of gasoline, compared with 38km for the current version, the newspaper said. Toyota said in October last year that cumulative sales of the Prius had reached 2 million units worldwide. 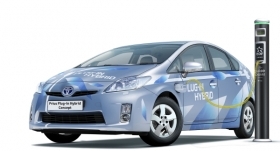 The company is aiming for overall hybrid vehicle sales of a million units a year by 2015, compared with 700,000 units in 2010, the Nikkei said. Although Toyota is also developing electric vehicles, these will require networks of recharging stations, which are not yet in place. Toyota is therefore looking to plug-in hybrids as the most promising next-generation technology, the Nikkei said. The Prius was launched in Japan in 1997 and began selling in Europe, North America and other markets in 2000. The second generation was released in 2003 and the third generation in 2009. Toyota sold 42,932 Prius models in Europe last year, up from 41,989 in 2009, according to data from JATO Dynamics. Toyota showed an EV prototype version of its iQ minicar at the Geneva auto show in March, ahead of a sales launch in 2012. The minicar will have an electric powertrain based on the Toyota Hybrid Synergy Drive system and a new flat lithium-ion battery pack that Toyota claims will give the car a potential driving range of up to 105km on a single charge. The EV prototype is being tested on European roads this year, with a potential market introduction through a leasing program expected in 2012. Toyota has already announced its plans to bring the car to market in the United States and is also investigating its viability in other regions. Just a little larger than the Smart ForTwo, the gasoline version of the Toyota iQ costs 11,900 euros in Germany. Toyota has not published prices for the iQ EV, but in November the automaker said the battery-powered iQ will be cheaper than rival electric cars such as the Mitsubishi i-MiEV or the Nissan Leaf. Both are larger than the 3+1-seat iQ. The iQ is being developed in-house, but Toyota is also working with luxury EV maker Tesla Motors Inc. on an electric version of its RAV4 compact SUV. U.S. sales of the SUV are planned for 2012. The electric cars are part of a push by Toyota to boost its range of environmentally friendly vehicles that will include the introduction of 11 hybrids by the end of 2012, including all-new and redesigned models. The Prius-based plug-in hybrid will be launched by early 2012 in Japan, the United States and Europe, with targeted sales of more than 50,000 units a year, priced at 3 million yen ($36,000) in Japan.